I parked in the Loblaws parking lot at Bayview and Moore Avenue. Another beautiful, sunny day, around 22 degrees. Perfect for a hike. If you look carefully you notice a sign on the laneway between the Pharma Plus and the Loblaws. It says “Pottery Road”. It seems out of place as there is another Pottery Road that runs down the hill from Broadview Ave. to Bayview Ave., right past Todmorden. The interesting thing is that, until about 55 years ago these pieces of Pottery Road were connected. The picture below, from 1947, shows Pottery Road (in red) wiggling up the middle of the picture and crossing the CPR tracks near the centre. The CPR tracks run almost straight up the middle of the photo. 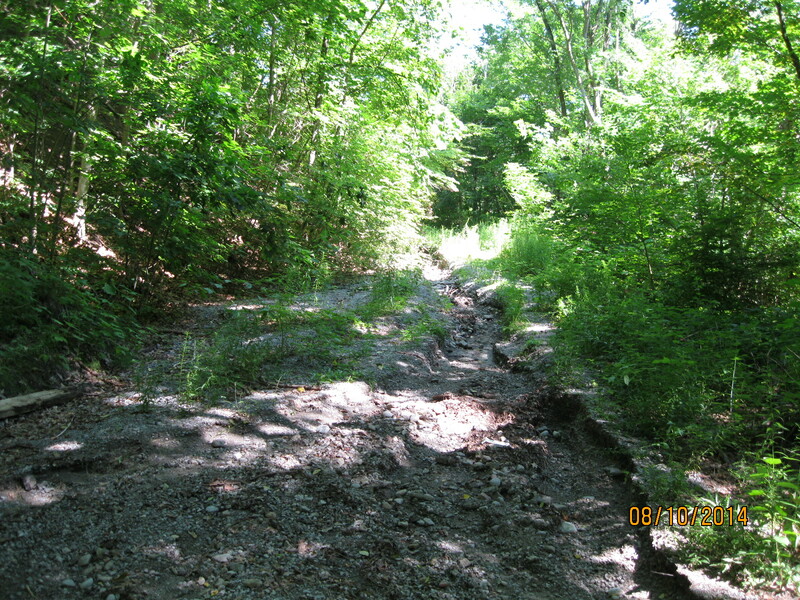 This section of the road is now abandoned. Pottery Road likely started off as part of an east-west Indian trail that crossed the city along the present route of Davenport Road. Today only about a third of the original Pottery Road remains. The portion going south from Loblaws has been taken over as an access route to a new construction site. I walked down it but it is a dead end now. 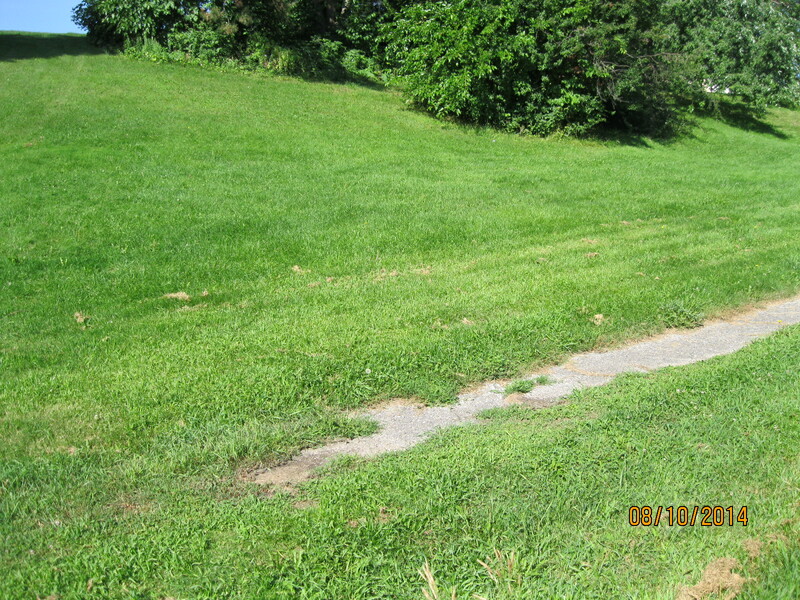 Along the way, parts of the old road can be seen sticking through the grass. This is a dead end now and you will have to go back to Bayview Ave and walk to Nesbit Street. 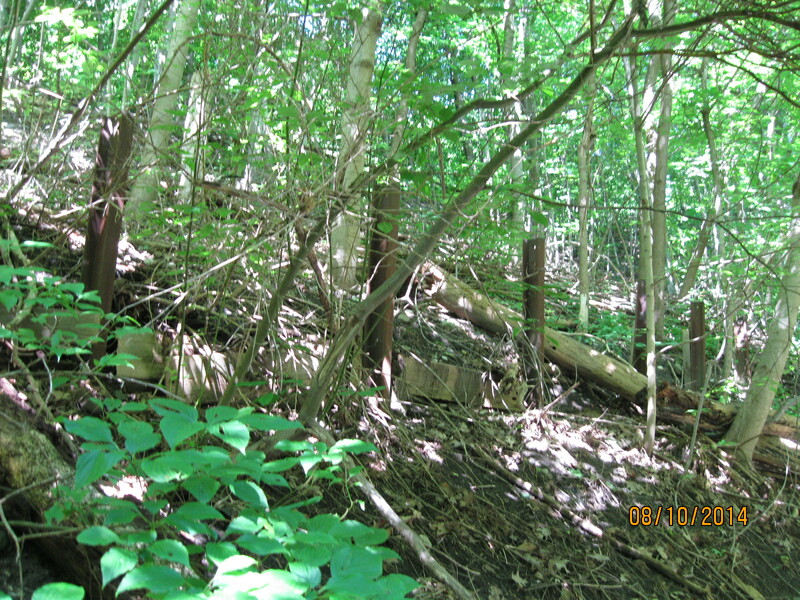 There is a little trail just off of True Davidson Drive just before the bridge that leads down to the old rail line. The old road crossed the now abandoned CPR tracks that lead to the Half-Mile Bridge and descended along the edge of the Cudmore creek. I missed the connection to the roadway and so I tried to find it from the south end of True Davidson Drive. I ended up in Rosedale Valley Ravine at the top of a 130 foot point of land. I found this shelter someone had built into the side of the hill. A place to sit in the sunshine, or retreat in the rain. 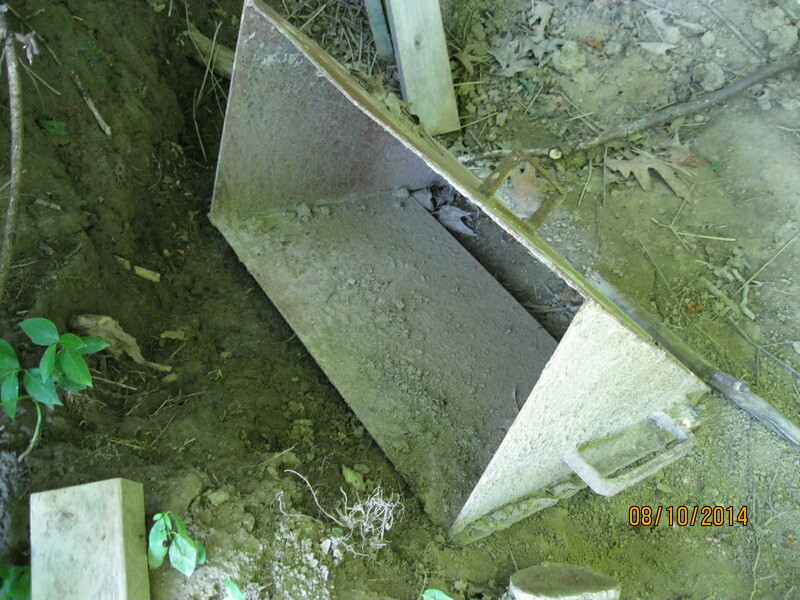 Inside they were using part of an old metal chute as a large scoop to dig their little hide-away. There appeared to be no going down the side of the ravine (even the coyote only had two places he would go). There was a rope tied to the trees just behind the fort and a series of steps were dug into the hillside. I decided to go down the hill using the rope to steady my decent. At the bottom I found my way across Cudmore Creek and onto Pottery Road. It has deteriorated badly in the four years since I first walked through here. With the erosion and new growth of trees it is hard to see that vehicles once roared up and down the hill here. In places the old road is washed out 3 feet deep. Under the pavement is a mess of broken bricks. The Don Valley Brick Works, owned by the Taylor brothers who were running Todmorden Mills in the 1890’s, is just south of here. 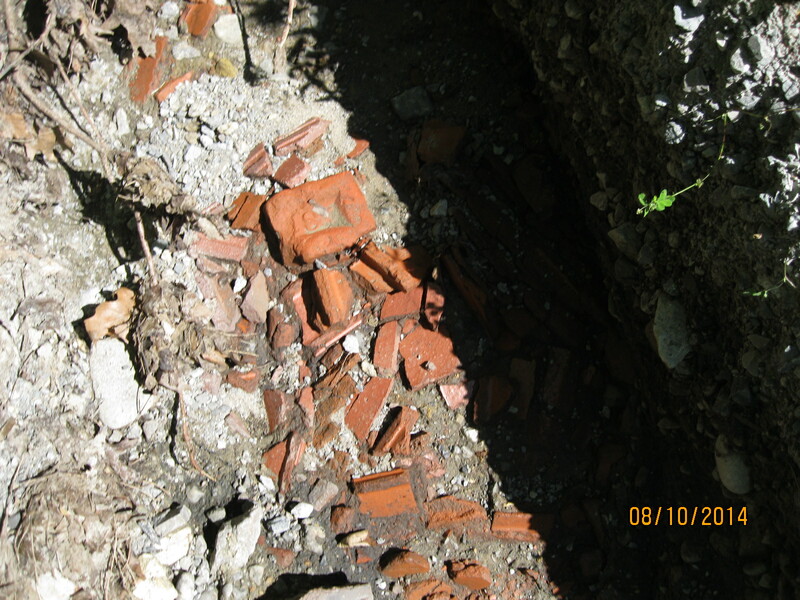 Any broken or defective brick had to be discarded and so they litter the Don river and every hillside in the area. It appears that they also formed the base for Pottery Road. I guess that when they paved over the bricks it was “Goodbye Red Brick Road”. Closer to the Bayview Extension the old steel posts for the guard rail stand like sentinels along the side of the old roadway. 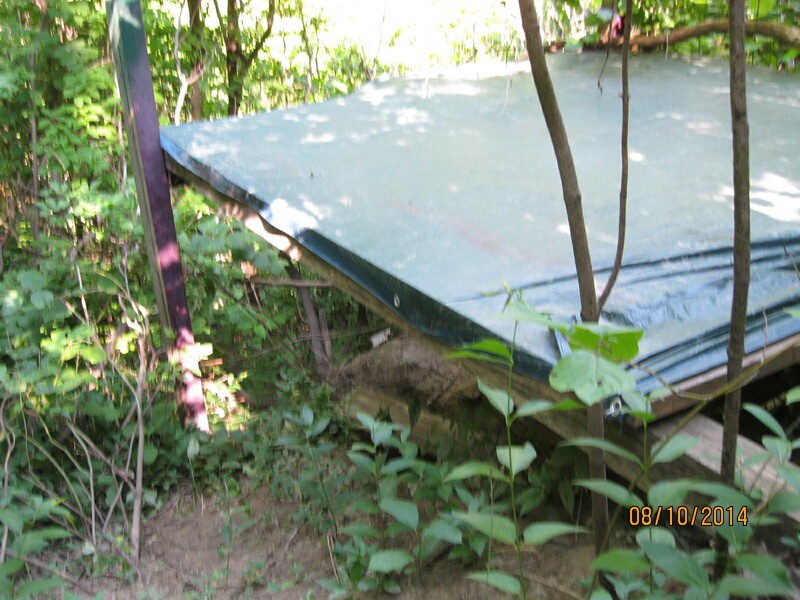 Their wooden facing has dropped off and is rotting on the ground. 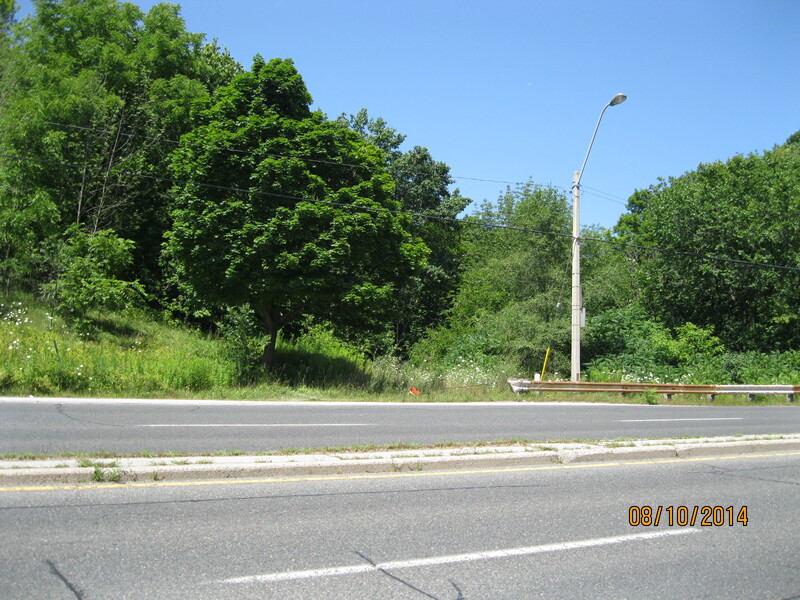 When the Bayview extension was built in 1959 Pottery Road was cut in two and the portion that climbed the hill along the Cudmore creek was cut off and abandoned. Today as you drive up Bayview avenue it is hard to pick out the location of the former road. Just at the end of the guardrail there is a chain with a red flag hanging on it. This marks the old roadway. It would have come straight across and connected with the bridge over the Don river. 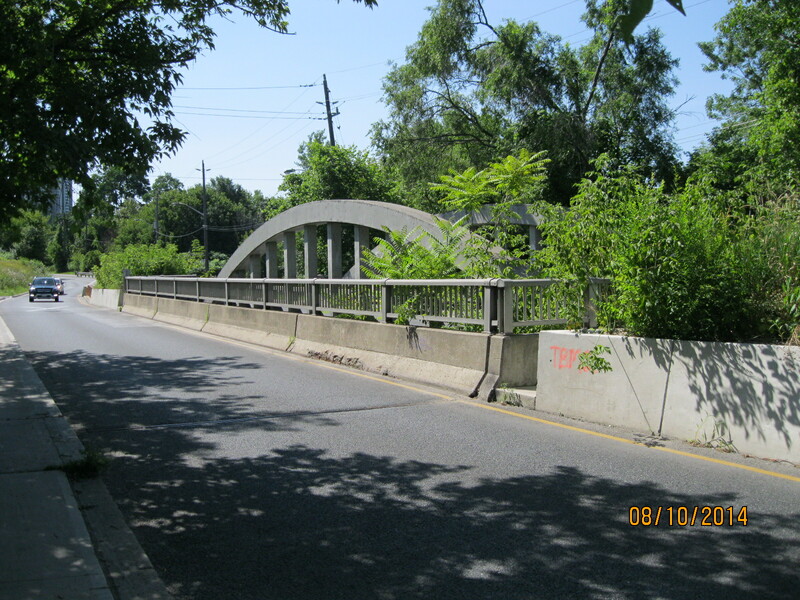 The 1928 bridge lies behind the newer one in the foreground. At the top of the hill the road currently curves to the south as it climbs the hill. The road originally went straight up the hill and met Broadview Avenue where Charles Sauriol Parkette is today. Broadview Avenue was built in 1798 by Timothy Skinner who ran the mills at Todmorden and was originally known as Mill Road until 1884. The name was changed to reflect the “broad view” from the crest of the hill looking over the mills in the valley. There is a Dairy Queen at the top of the hill which proved to be a distraction that kept me from getting to the parkette to take a last photo. This entry was posted in Don River, Hiking GTA and tagged Don River, Hiking, Pottery Road on August 13, 2014 by hikingthegta. Great info! I traced this walk today. I started from Broadview station though and found it easier to follow the original Pottery Road heading north after Bayview. Not sure where the original road crossed the tracks but what felt like a natural spot I followed it and ended up running on the west side of the tracks close to the back of some houses (Douglas Crescent) and eventually up to True Davidson Dr/Nesbitt Park. 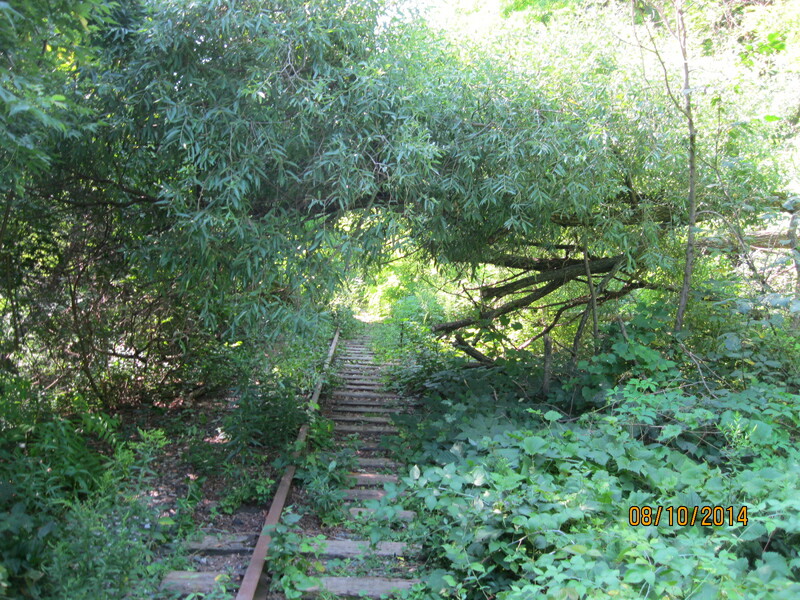 After heading through Bennington Heights Park to the end of Pottery I headed back down Bayview to Crowthers Woods Trail and got on the abandoned railway line, following it south to the Brickworks. Took about 2 hours total with my dogs. Great hike!